The Chancellor’s Summer Scholars Program offers students the opportunity to develop skills to prepare them for a career in the science, technology, engineering and mathematics (STEM) or STEM-related fields. The program is funded by Washington River Protection Solutions. Students Amy Alvarado, Adriana Iturbe, Jared Johnson and Marsobyn Salalila are working with Sena Clara Creston, clinical assistant professor of fine arts and digital technology and culture, to blend their expertise in engineering and the arts to create a moveable and engaging “Plastic Garden” that responds to its environment and aims to evoke emotional expression from its viewers. Specifically, the team will spend the summer using 3D printers, laser cutters and engineering techniques to create the inner mechanics of flowers within the garden, which will open and close as to respond to their environment. Upon end completion, the garden will feature a range of mechanically-based plants and creatures that respond to their environment. 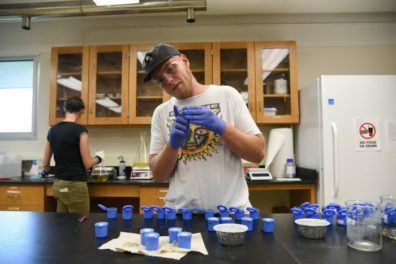 Rhenton Brimberry (facing camera) working in the lab at WSU Tri-Cities. Rhenton Brimberry is working with Sarah Roley, assistant professor of environmental sciences, to study the effects of seasonal irrigation flows on microbes and algae in the Yakima River watershed. Microbes and algae can mitigate nutrient pollution by removing and processing excess nutrients, but most of these assessments have occurred in the non-irrigated midwestern United States. In the irrigated West, seasonal irrigation flows influence nutrient quantity and quality, and so may influence microbial nutrient uptake, as well. By examining algal and microbial responses to nutrient inputs, this project can inform management of nutrient pollution in irrigated agricultural watersheds. Student Megan Brauner working in the lab at WSU Tri-Cities. 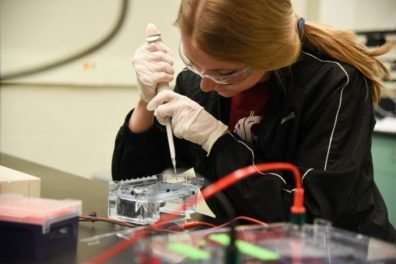 Student Megan Brauner is working with Tanya Cheeke, assistant professor of biology, to develop and test a new molecular technique for quantifying mycorrhizal fungi in roots and soil. The fungi, known as arbuscular mycorrhizal fungi, form symbiotic relationships with most plant species, and have been shown to improve native plant growth in disturbed ecosystems. However, quantifying mycorrhizal fungi from environmental samples remains difficult. Development of this technique will be useful for other fungal researchers and will allow further investigation into the effectiveness of mycorrhizal inoculations in ecological restorations. Like Brauner, student Ella Krinitsyn, is also working with assistant professor Cheeke. Her research pertains to the use of mycorrhizal fungi to restore native plant populations. Her research focuses on on evaluating the correlation between the percentage of mycorrhizal fungi colonization and the percentage of native or invasive plants within sites they are hoping to restore at the Meyer’s Point Environmental Field Station in Olympia, Washington. The project will provide valuable information needed to find effective restoration strategies to improve the growth of native plants and mycorrhizal fungi in landscapes impacted by disturbances. 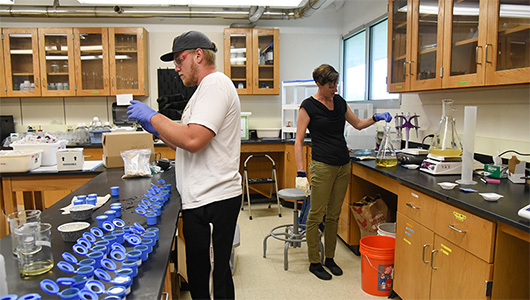 Top image: Rhenton Brimberry (left) working with Sarah Roley, assistant professor of environmental sciences, in the lab at WSU Tri-Cities.